SIS LIVE: Outside Broadcast/Satellite uplink - new teleport. 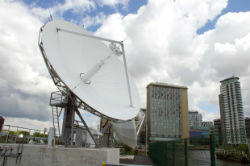 Milton Keynes, UK, 10th July 2012: Satellite uplink and outside broadcast specialist, SIS LIVE, announces the launch of its brand new teleport facility at MediaCityUK in Salford. It is the largest broadcast teleport ever built in the north of the UK and confirms the company’s position as the leading provider of satellite facilities in Europe. This state of the art facility includes nine satellite dishes; two 3.8m, two 4.8m, two 6.3m, two 8.1m and one 9m, plus a handful of smaller dishes. The new teleport is located on Trafford Wharfside, close to the new Coronation Street facility. Making use of optimised viewing angles of at least 45°East to 45°West, and via careful placement and separation, the dishes are able to see most satellites in use in the UK. The new teleport is set to go live in line with SIS’s relocation into its new Blue Tower headquarters in July 2012. It will prove a significant asset to SIS’s already impressive inventory of facilities, and further extend its wide-ranging service offerings in the satellite and broadcast markets. · All dishes are manufactured by General Dynamics Vertex models. · All have four port feeds and are transmit capable. · The teleport is connected to the SIS control room by fibre optic cables. · Two completely separate circuits are in place.